If you decide to do longer races, I’d recommend you try VESPA, not the scooter but the sports supplement made from wasp extract. 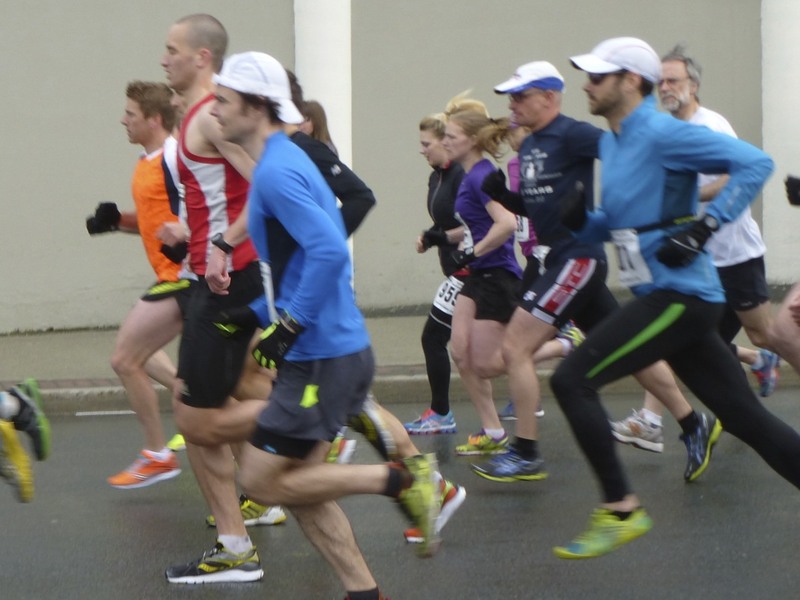 Also, I don’t think you need to carbo load – that is, eating massively more carbs than before the race (I carbo loaded for my first long race – 23 K – and I was so sluggish it was painful). I probably mis-represented my pre-race meal as carb-o-loading. In all honesty, it’s essentially the same breakfast I eat almost every single day, just not the banana. I have this and my blood glucose dialed in to a science. 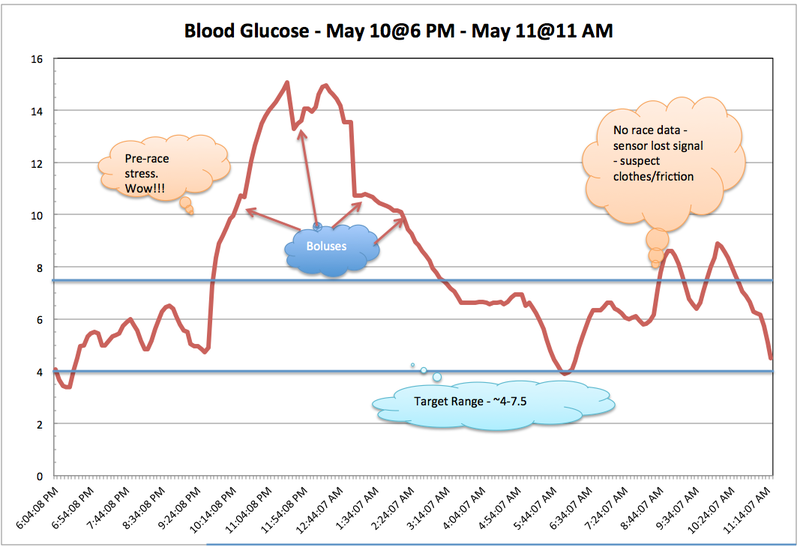 In fact, it’s how I can tell if I have a bad infusion site or not, just based on how my body responds in the AM. My reference to carb-o-loading will be for prep for a couple of marathons later this year. It’s similar to the approach I took when preparing for a couple of cycling centuries, and is more so aimed at ensuring ample glycogen stores. Carb-o-loading pre-race is not very helpful if you haven’t done it the weeks before. I tend to eat ~40% carb diet, so I’ll only be bumping up to 50-60%. What I should’ve said is I woke up early and ate this pre-race meal in ample time to allow it to enter my system and not be a brick. It allowed me to restore any glycogen lost overnight, but also allowed enough time to work out the spike of the insulin and ensure I wasn’t going hypo or bonking – that sort of timing would’ve resulted in sluggish performance. Timing a meal pre-race for a diabetic is tricky – too early with insulin and you may bonk, too late and you risk hyperglycaemia and sluggishness. Your muscles perform best when there is the perfect balance of insulin to blood glucose to ensure it is leaving the blood and entering the muscles, while leaving enough for your brain. I have a half marathon and a 10 mile race coming up soon. They will let me put into practice my fueling strategies under a longer duration. Generally, I can run a 1/2 on a piece of toast and a cappuccino, but that’s a solo run before breakfast. In a race environment I think I’ll run a larger portion of it in zone 4, so I’m going to need to plan a bit more for nutrition. I hope to share what I learn from these few races prior to my marathon in August (and another in September). The race environment is what has me learning – I tend to push my body harder for longer periods of time. However, a great quote from Nietzsche (ironically, from the Skratch Labs cookbook) is, “You have your way. I have my way. As for the right way, the correct way, and the only way, it does not exist.” – in other words, to each their own which is why I am so very glad you commented and shared that. You learn something new each day, and I’m very intrigued. I’d love to hear how often you use it, if you have one run to the next to compare to; those sorts of things. 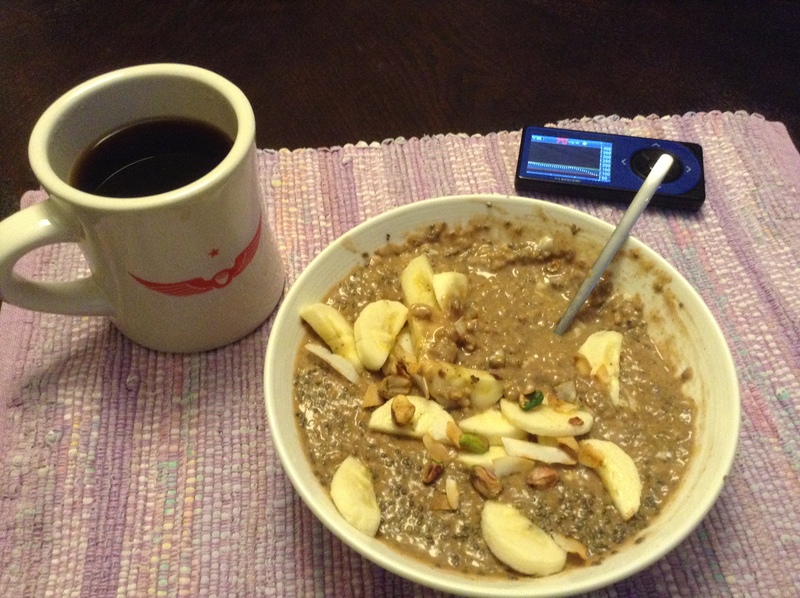 My fueling for long runs – normal breakfast about 2-3 hours before run. Depending on the distance, I may have about 80 ml. yogurt. I carry with me cut bananas or cut oranges. 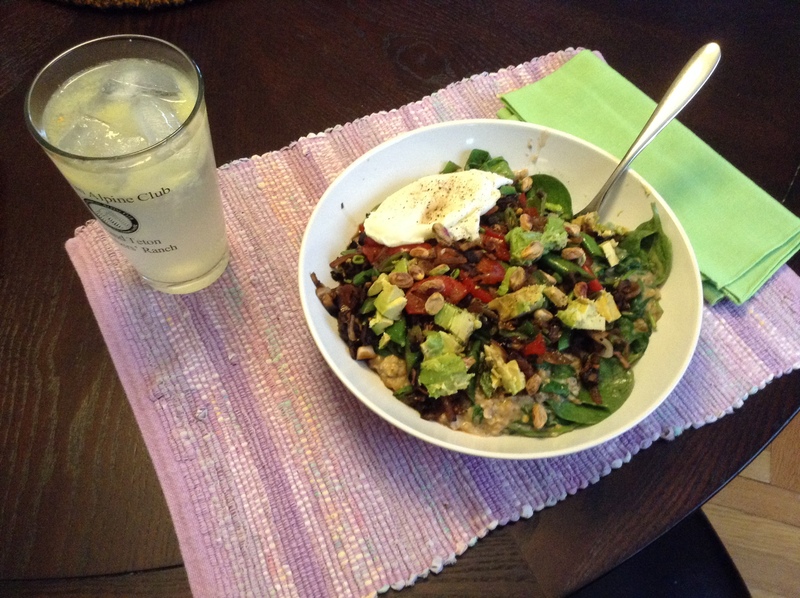 I’ve been experimenting on supplements (not Clif Bar or Power Bar) focusing on electrolytes. I’ve stopped having gels, sweet sports drinks, Clif Bar, Power Bar and anything similar to them – they give me a really awful sugar high and crash (not so good when I have to do a 30 Km run). I got unto VESPA only recently, to see if works as a combo of electrolytes and carbs. So far, I found it helpful. But I agree that I have to use it in more races to get a better picture of its usefulness. It is a bit pricey, so I intend to use it sparingly. That means, unless I’m doing distances longer than a half marathon, I won’t be relying it as much as I rely on bananas.